Although it probably should have been a requirement, I can’t remember if I’d ever built a campfire before taking a job to cook on a guest ranch near Garner State Park. That was more than a decade ago, when my husband David Norman and I moved from Manhattan to a staggeringly beautiful property in the Hill Country. But what we lacked in frontier skills, we made up for in enthusiasm. So we drove our truck over the cattle guard and dove in. As we settled into the rhythm of ranch life, lighting fires became mostly David’s job—a charge that he relished. This was mainly because of how our duties were divided early on. I was typically in the kitchen, whisking vinaigrettes, shaking skillets, and juggling guests while David was happily “out back” gathering wood for his bread oven, grilling chicken thighs, or building a campfire for evening s’mores (and I’m quite certain, drinking a couple of beers on the sly). 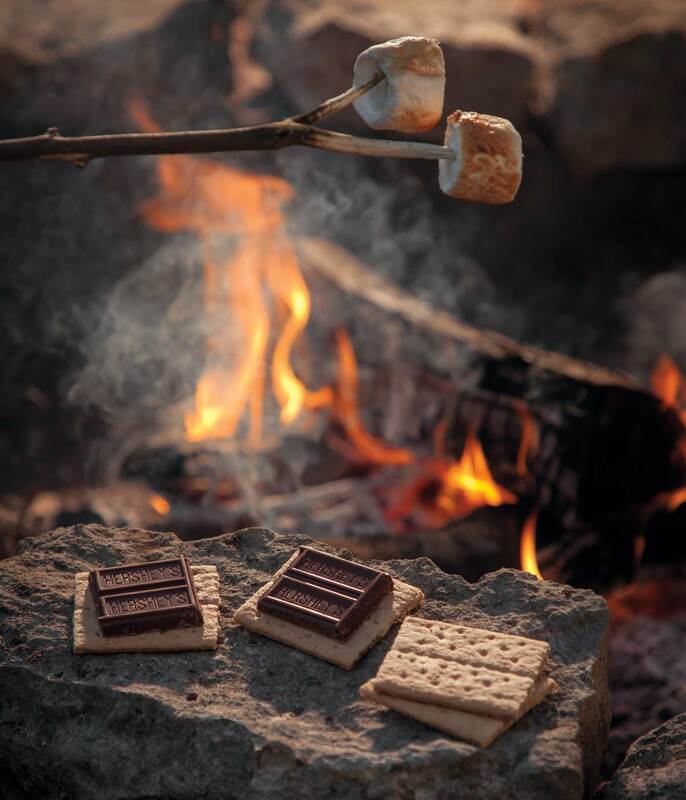 David rose at dawn to orchestrate weekly campfire breakfasts—biscuits baked in a Dutch oven, huevos fried to order, and boiled coffee thick enough to chew. Meanwhile, I was in the lodge making salsa, prepping dinner, and squashing the occasional scorpion. That’s the cool thing about grilling: The deep, complex flavors created by cooking over fire don’t need fussy adornments. I’ve always gravitated to the pleasures of a roaring fire and the wafting aroma of wood smoke. But back then, a fire was a reward after my kitchen duties were complete—not necessarily a means to dinner. 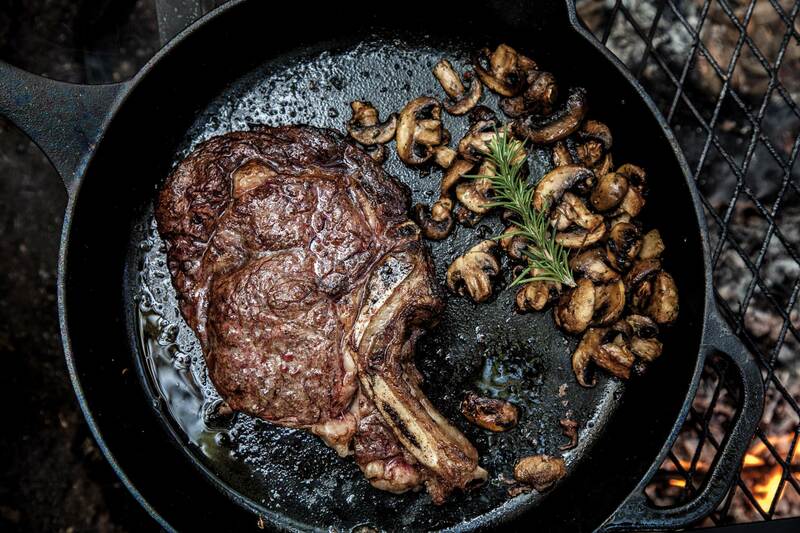 When we transitioned a few years later to urban life in Austin, our rustic grill—a heavy, round piece of equipment with a hinged grate—became a relic of our former life and the source of the occasional Saturday-night rib-eye. But my connection to campfires was rekindled when our children were born. As they grew, so did our desire to explore Texas’ state parks and the magnificent landscapes and rivers that we knew from songs by Lyle Lovett, Guy Clark, and Joe Ely. With our little native Texans in tow, we ventured out family-style, stuffing the car with packed coolers, bug spray, stuffed animals, tequila, limes, and other weekend essentials. Naturally, I obsessed about the food. Before each trip, I dreamed up complicated menus and photograph-worthy meals (who cares that no one has socks to wear, we have twinkly lights and flaky salt!). In my transition from ranch chef to Sherpa, I didn’t consider hungry kids, unpredictable weather, and limitations of campsite grills as I planned dinner. When we went to Inks Lake, for instance, I served a pretty fruit salad in carved melon cups, but I couldn’t pull together my dinner idea (grilled farmer’s market carrots and strip steak) before my kids lost interest. A few months later, I scorched a fancy steak at Pedernales Falls. When we spent Thanksgiving at Enchanted Rock, dinner ran so late after tent-wrangling that chips and salsa became a better option. Then came the game changer. As I developed my just-released cookbook, Any Night Grilling (Ten Speed Press), I undertook several months of firing up dinner on our charcoal and gas grills. David and I swapped roles as I signed on as backyard cook while he graciously held down the fort inside. And so began several months of nightly grilling everything from flatbreads and whole fish to leg of lamb. What began as somewhat of a scramble settled into a steady rhythm, with smarter game plans, confidence in building and managing fires, and recipes that home cooks can knock out any day of the week. That’s the cool thing about grilling: It creates big flavors quickly—and it’s also a whole lot of fun. Needless to say, I’ve upped my grill game. These days, the whiff of a wood fire makes me yearn to cook, and I know how to plan accordingly. Whether it’s dinner on the back porch or in the woods, I keep my menu simple, as the complex, smoky flavors created by grilling don’t require a lot of additional flourish. I pack the basics (tongs, bread knife, cutting board, olive oil, salt and pepper, and of course—a lime squeezer) and place meat on the hot grates when the coals are glowing red and covered with gray ash. Then I feel confident moving it around the heat as needed for even cooking and to avoid flare-ups. It’s not always perfect. Like making paella or the perfect pie crust, nailing the precise doneness of, say, a whole grill-roasted chicken or smoked duck is a lifetime pursuit. But that’s just fine—near the warmth of a fire, with family and friends in tow, all is well.